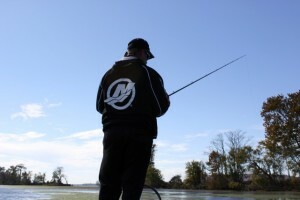 Most anglers are known for a particular technique or style. McClelland – football jig, KVD – Crankbaits, Reese – Power Fishing, Velvick – Swimbaits, Monroe – shallow water, Brauer – Flippin’, Rowland – Topwater, and the list goes on. Chris Lane is all about the grass. The native Floridian, who transplanted to Guntersville, Ala., feels right at home when the water he has his boat in is inundated with aquatic grass. 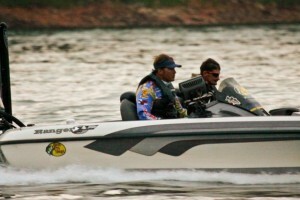 To Lane, grass means bass, and when the right factors are there; it means the right kind of bass. Grass provides ambush points, it provides oxygen, shade and temperature variations to the bass, and Lane knows it means more and bigger bites to him. 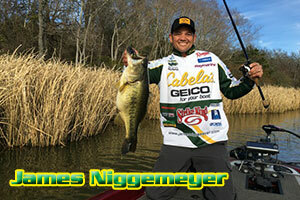 While it may seem to the average angler that every grass mat will hold bass; that’s not always the case. All types of grasses will hold grass, but Lane feels that the right grass is defined by what the bass need at the moment. Lane keeps his technique fairly consistent throughout the year when he is using a heavy weight to penetrate the grass. He usually starts with a Gambler BB Cricket in a black and blue color, he matches it with a 3/4 to 1.5 -ounce Gambler tungsten weight depending on the thickness of the cover. his approach is to pitch the lure into the cover and allow the weight to push through the cover. 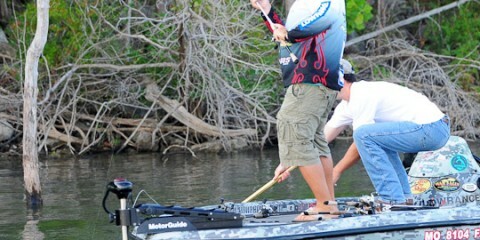 he does not pitch the rig high into the air and let it splash down because he doesn’t want to spook fish. 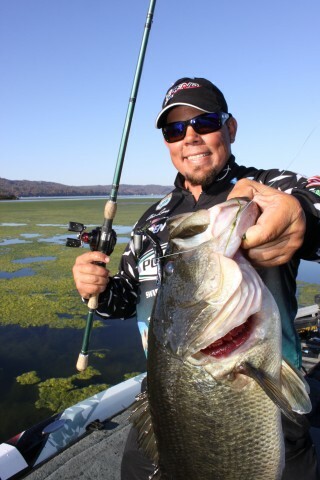 Lane uses a 7’6″ All Star Series Flippin’ rod, which he pairs with an Abu Garcia Revo SX in 6.4:1 that he spools with 65-pound-test Stren Sonic Braid. He uses a 4/0 to 6/0 Gambler KO Flippin’ Hook depending on the size of the bait, and he typically uses the BB Cricket, but if he feel like he needs a bigger profile; he will switch to a Gambler Ugly Otter.